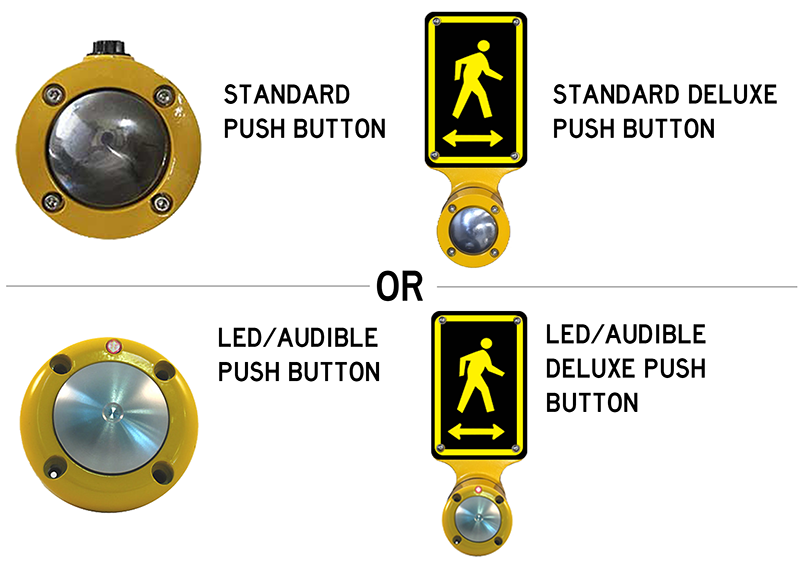 Standard Push Button – Pedestrians use this push button to activate the blinking LED sign. Deluxe Push Button – Pedestrians use this push button to activate the blinking LED sign – comes with an additional 5” x 7” Pedestrian Sign. Confirmation Button –This button provides both LED and audible feedback to let the pedestrian know that the message has been received. MUTCD and ADA Compliant. Example: Sign will turn on from 7:30AM – 11:30AM and then turn on again from 12:00PM – 4:00PM. Signs that utilize this timer will blink as scheduled seven days a week. Deluxe School Zone Timer – Similar to the standard timer—this timer will also allow the sign to blink at multiple times throughout the day. The benefit of the deluxe timer is that you can also schedule days of the week you wish the sign to blink. Example: Signs will turn on Mon – Friday 7:30 AM – 11:30 AM and again from 12:00 PM – 4:00 PM. You can also schedule the sign to remain off for holidays, summer break, snow days, etc. This timer activates the flashing LED sign from dusk until dawn.